In a year of record-setting heat on a blistered globe, with fast-warming oceans, fast-melting ice caps, and fast-rising sea levels, ratification of the December 2015 Paris climate summit agreement — already endorsed by most nations — should be a complete no-brainer. That it isn’t tells you a great deal about our world. Global geopolitics and the possible rightward lurch of many countries (including a potential deal-breaking election in the United States that could put a climate denier in the White House) spell bad news for the fate of the Earth. It’s worth exploring how this might come to be. That geopolitics will play a decisive role in determining the success or failure of the Paris Agreement has become self-evident in the short time since its promulgation. While some progress has been made toward its formal adoption — the agreement will enter into force only after no fewer than 55 countries, accounting for at least 55% of global greenhouse gas emissions, have ratified it — it has also encountered unexpected political hurdles, signaling trouble to come. On the dark side, however, Great Britain’s astonishing Brexit vote has complicated the task of ensuring the European Union’s approval of the agreement, as European solidarity on the climate issue — a major factor in the success of the Paris negotiations — can no longer be assured. “There is a risk that this could kick EU ratification of the Paris Agreement into the long grass,” suggests Jonathan Grant, director of sustainability at PricewaterhouseCoopers. In his first major speech on energy, delivered in May, Trump — who has called global warming a Chinese hoax — pledged to “cancel the Paris climate agreement” and scrap the various measures announced by President Obama to ensure U.S. compliance with its provisions. Echoing the views of his Brexit counterparts, he complained that “this agreement gives foreign bureaucrats control over how much energy we use on our land, in our country. No way.” He also vowed to revive construction of the Keystone XL pipeline (which would bring carbon-heavy Canadian tar sands oil to refineries on the U.S. Gulf Coast), to reverse any climate-friendly Obama administration acts, and to promote the coal industry. “Regulations that shut down hundreds of coal-fired power plants and block the construction of new ones — how stupid is that?” he said, mockingly. Russia is similarly likely to put domestic economic needs (and the desire to remain a great power, militarily and otherwise) ahead of its global climate obligations. Although President Vladimir Putin attended the Paris summit and assured the gathered nations of Russian compliance with its outcome, he has also made it crystal clear that his country has no intention of giving up its reliance on oil and natural gas exports for a large share of its national income. According to the Energy Information Administration, Russia’s government relies on such exports for a staggering 50% of its operating revenue, a share it dare not jeopardize at a time when its economy — already buffeted by European Union and U.S. sanctions — is in deep recession. To ensure the continued flow of hydrocarbon income, in fact, Moscow has announced multibillion dollar plans to develop new oil and gas fields in Siberia and the Arctic, even if such efforts fly in the face of commitments to reduce future carbon emissions. In such a future, Statoil suggests, the major powers would prove to be far more concerned with satisfying their own economic and energy requirements than pursuing collaborative efforts aimed at slowing the pace of climate change. For many of them, this would mean maximizing the cheapest and most accessible fuel options available — often domestic supplies of fossil fuels. Under such circumstances, the report suggests, the use of coal would rise, not fall, and its share of global energy consumption would actually increase from 29% to 32%. Coming from a major fossil fuel company, this vision of how events might play out on an increasingly tumultuous planet makes for peculiar reading: more akin to Eaarth — Bill McKibben’s dystopian portrait of a climate-ravaged world — than the usual industry-generated visions of future world health and prosperity. And while “rivalry” is only one of several scenarios Statoil’s authors considered, they clearly found it unnervingly convincing. Hence, in a briefing on the report, the company’s chief economist Eirik Wærness indicated that Great Britain’s looming exit from the EU was exactly the sort of event that would fit the proposed model and might multiply in the future. Indeed, the future pace of climate change will be determined as much by geopolitical factors as by technological developments in the energy sector. 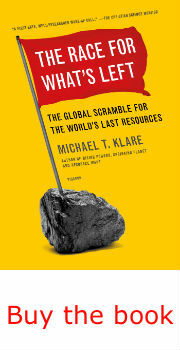 While it is evident that immense progress is being made in bringing down the price of wind and solar power in particular — far more so than all but a few analysts anticipated until recently — the political will to turn such developments into meaningful global change and so bring carbon emissions to heel before the planet is unalterably transformed may, as the Statoil authors suggest, be dematerializing before our eyes. If so, make no mistake about it: we will be condemning Earth’s future inhabitants, our own children and grandchildren, to unmitigated disaster. To avoid an Eaarth (as both Bill McKibben and the Statoil authors imagine it) and preserve the welcoming planet in which humanity grew and thrived, climate activists will have to devote at least as much of their energy and attention to the international political arena as to the technology sector. At this point, electing green-minded leaders, stopping climate deniers (or ignorers) from capturing high office, and opposing fossil-fueled ultra-nationalism is the only realistic path to a habitable planet.